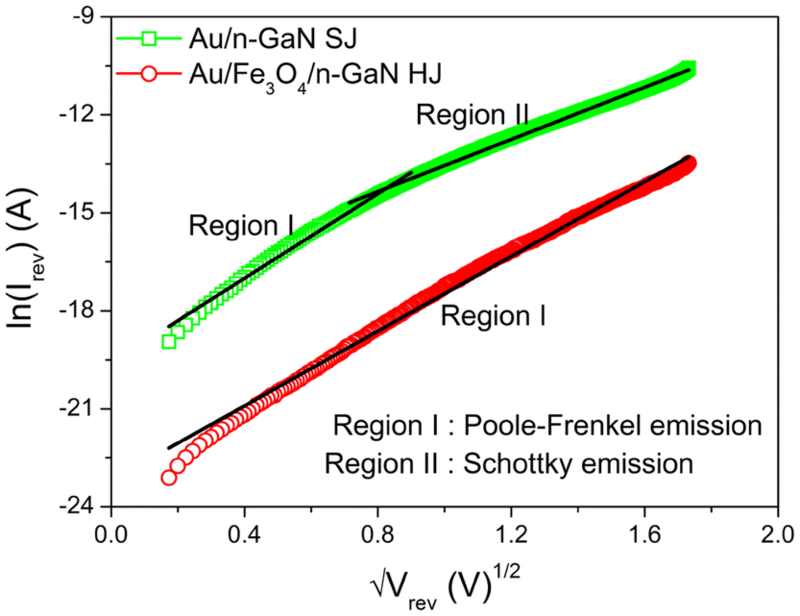 This work demonstrates the modification of electrical parameters of the Au/n-GaN Schottky junction (SJ) by a thin magnetite metal (Fe3O4) interlayer in between the Au and n-GaN substrates. The current–voltage (I–V), voltage-dependent capacitance–frequency (C–f) and conductance–frequency (G–f) characteristics of the Au/Fe3O4/n-GaN heterojunction (HJ) are systematically studied. Using statistical analysis, the mean barrier heights and ideality factors are found to be 0.70 eV and 1.62 for the SJ and 0.84 eV and 1.87 for the HJ, respectively. It is noticed that the mean barrier height of Au/Fe3O4/n-GaN HJ increases as compared that of the Au/n-GaN SJ, indicating the Fe3O4 interlayer modified the barrier height. The SJ revealed a transition from Poole–Frenkel emission at low voltages to Schottky emission at high voltages. However, the HJ exhibited Schottky emission over whole voltage range. It is observed that the higher values of capacitance decrease at low frequencies that are attributed to the excess capacitance resulting from the interface states in equilibrium with the n-GaN which could respond the ac signal. The interface states density (NSS) and relaxation time (τ) of the Au/Fe3O4/n-GaN HJ are estimated from C–f plots, respectively. The NSS reveals that the interface states decrease with voltage from the bottom of the conduction band toward the mid-gap. Gallium nitride (GaN) has grown to be very promising semiconductor material for the development of optoelectronic, high-power and high-frequency devices [1, 2]. In general, GaN-based materials attracted in small spin–orbit coupling due to its wide band gap; this is splendid for spintronic applications [3, 4]. Specifically, GaN-based spintronic devices would be very effective than GaAs-based devices for the cause of the long spin transport length in this material [5, 6, 7]. In fact, the spin transistor contains one ferromagnetic metal contact that works as a spin injector while the other one acts as a spin detector. Very interestingly, these issues could be closely related to recent works in semiconductor spintronics . From this point of view, it can be concluded that every semiconductor spintronic device needs ferromagnetic metal contact in an effective way for feasible manufacturing purpose. Ferromagnetic metal-based schemes have been widely examined for the fabrication of Schottky contacts on semiconductors [9, 10, 11, 12, 13]. For example, Van Erve et al. demonstrated that the Fe/AlGaAs interface showed highly efficient spin injection. Garrido et al. reported the electrical properties of Fe/GaN Schottky barrier contacts and showed the barrier contact satisfies the spin injection experiments. Kumar et al. fabricated Fe Schottky contacts on GaN and investigated the temperature-dependent I–V characteristics in a wide range of 100–300 K and found an inhomogeneous behavior at the Fe and GaN interface, which makes spin relaxation time in GaN for spintronic applications. Janardhanam et al. fabricated the Ni0.8Fe0.2/n-type GaN Schottky diodes and reported the barrier height and ideality factor as a function of temperature. Yang et al. demonstrated the current–voltage (I–V) characteristics of Fe3O4/Nb-doped SrTiO3 (Nb: STO) and Fe3O4/ZnO junctions that were prepared by pulsed laser deposition. They showed that the rectifying behavior of Fe3O4/Nb: STO junction was better than that of the Fe3O4/ZnO junctions. 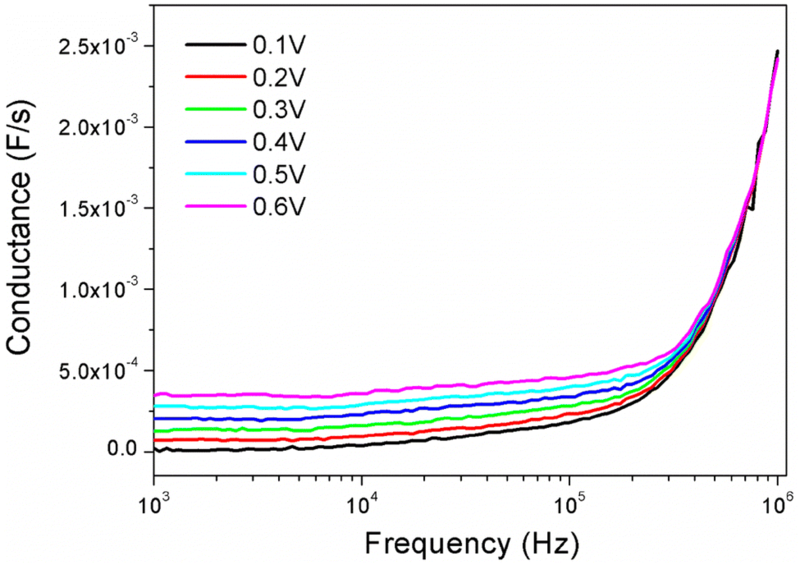 Based on the above review, in this work, it is proposed to fabricate and characterize the Au/Fe3O4/n-GaN heterostructure (HJ) with a magnetite interlayer and analyzed by current–voltage (I–V) and capacitance–frequency (C–f) measurements. Some researchers have reported the using of ferromagnetic metals as contact or an interfacial layer between the metal and semiconductor (MS) junctions such as Ni, Co, Fe, magnetite (Fe3O4), nickel–iron alloy (NiFe) and permalloy (Ni0.8Fe0.2) [14, 15, 16]. In the present work, magnetite (Fe3O4) is selected since it is used in a variety of applications such as catalysis, bio-processing, audio and videotape, high-density digital recording, magnetic fluids and information and energy storage, including microwave devices, magneto-optics devices, sensors and high-frequency applications [17, 18, 19, 20, 21, 22]. Also, Fe3O4 may be used as ferromagnetic material for electrodes in magnetic tunnel junctions (MTJ) . Further, Fe3O4 is non-toxic and biocompatible. 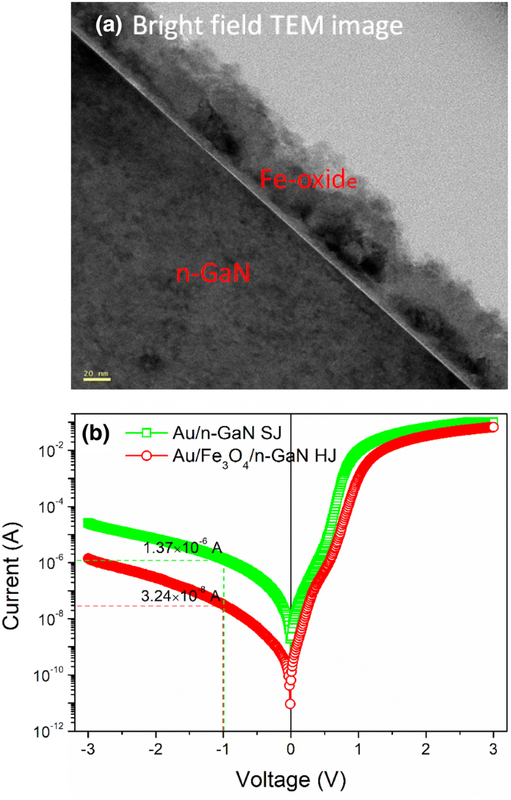 Due to exceptional properties of Fe3O4 material, in this work, the Au/Fe3O4/n-GaN heterojunction (HJ) is fabricated with a Fe3O4 interlayer in between the metal and n-GaN, the electronic parameters such as barrier height (Φb) and ideality factor (n) are examined, and these electronic parameters are compared with the conventional Au/n-GaN Schottky junction (SJ). The statistical distribution analysis is applied to obtain the mean values barrier height and ideality factors of SJ and HJ using Gaussian distribution function. Afterward, the capacitance–frequency (C–f) and conductance–frequency (G–f) characteristics of the Au/Fe3O4/n-GaN HJ are measured in the frequency range of 1 kHz to 1 MHz with different applied biases at room temperature. Finally, the interface state density distribution and relaxation time of the Au/Fe3O4/n-GaN HJ are estimated and discussed. GaN (Si-doped) wafers with 2 μm thickness grown on c-plane Al2O3 (0001) sapphire substrate using metal organic chemical vapor deposition method and carrier concentration of about 4.07 × 1017 cm−3 were used in this work. 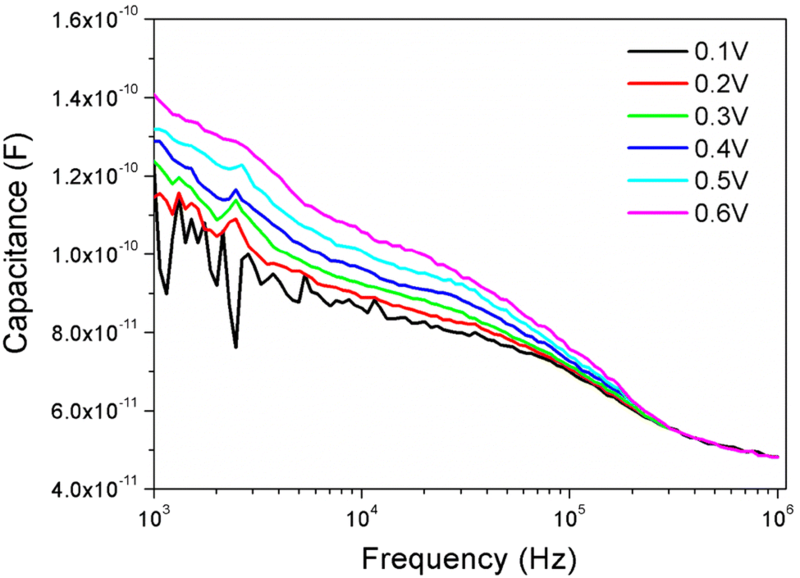 Prior to deposition of magnetite (Fe3O4), the n-type GaN samples were ultrasonically cleaned with warm trichloroethylene followed by acetone and methanol for 5 min each step. The samples were then dipped into buffered oxide etch (BOE) solution for 10 min to remove the native/surface oxide layer and immersed in deionized (DI) water. After this procedure, the wafer was dried with N2 atmosphere. In order to make both ohmic and Schottky electrodes, standard photolithography and lift-off approaches were used. To make ohmic contacts, Ti and Al metals were deposited sequentially with thickness of 25 and 100 nm by electron beam (e-beam) evaporation approach. Then, the contacts were immediately annealed at 750 °C in N2 ambient for 1 min using a rapid thermal annealing system and the defined electrodes were dipped into a BOE solution for 30 s. Next, the magnetite (Fe3O4) was deposited using an electron beam method on cleaned n-type GaN surface followed by 30 nm thickness gold as Schottky contact. The circular Schottky electrode area was 3.14 × 10−4 cm2. The current–voltage (I–V) characteristics were carried out using a Keithley source unit 2400. In addition, the voltage-controlled capacitance–frequency (C–f) and conductance–frequency (G–f) characteristics were evaluated using a phase sensitive multimeter unit PSM 1700. Based on the logarithmic I–V data, the slope gives the ideality factor, n, values and the values extracted for ten diodes are in the range of 1.51–1.74 and 1.69–1.93 for the Au/n-GaN SJ and Au/Fe3O4/n-GaN HJ, respectively. The obtained values of ideality factor are higher than one for both the junctions. These high values may be due to the image force lowering, interface states existence at the interface, non-uniform interlayer formation between the metal and semiconductor, and barrier inhomogeneities [27, 28, 29]. The barrier heights are evaluated for ten fabricated diodes and the estimated effective Φbh ranging from 0.64 to 0.74 eV and 0.74–0.86 eV for the Au/n-GaN SJ and Au/Fe3O4/n-GaN HJ, respectively. Basically, the ideality factor and barrier height values are changed from junction to junction even though the junctions are fabricated with same conditions. In fact, analysis shows that the barrier height between the metal and semiconductor effectively depends on the applied bias excluding the image force effect for the ideal diodes. Therefore, it is important to analyze results with average ideality factor and barrier height values using statistical distribution analysis. Figures 2 and 3 show the statistical distribution, and box and whisker plots of the ideality factor and barrier height values obtained from the I–V data and fitted by Gaussian distribution function for ten Au/n-GaN SJ (Figs. 2a, c, 3a, c) and Au/Fe3O4/n-GaN HJ (Figs. 2b, c, 3b, c). 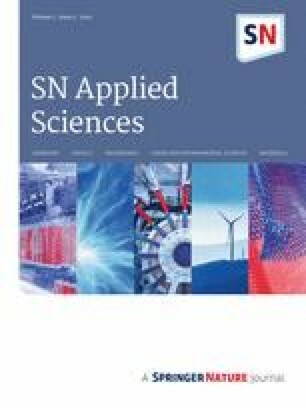 The average ideality factor values of 1.62 and 1.87 with normalization deviation of 0.09 and 0.08 for the Au/n-GaN SJ and Au/Fe3O4/n-GaN HJ, respectively, are obtained from the statistical analysis (Fig. 2a, c). From Fig. 3a, c, the statistical analysis provides average barrier height values of 0.70 eV and 0.84 eV with normalization deviation of 0.02 eV and 0.08 eV for the Au/n-GaN SJ and Au/Fe3O4/n-GaN HJ, respectively. The barrier height estimated for the Au/Fe3O4/n-GaN HJ compared with that of the reported barrier height values obtained for the other devices in the literature, for instance, is 0.72 eV for Al/Fe3O4/p-Si junction , 0.88 eV for Au/Fe3O4/p-Si Schottky contacts , 0.82 eV for Au/CZTS/n-GaN HJ , 0.98 eV for Au/Gd2O3/n-GaN HJ , 0.94 eV Au/ZrO2/n-GaN MIS junction . It is noted that the average barrier height difference between Au/n-GaN SJ and Au/Fe3O4/n-GaN HJ is 0.14 eV. This may be the cause of occurrence of the interlayer between the Au and n-GaN, which plays as a physical barrier. 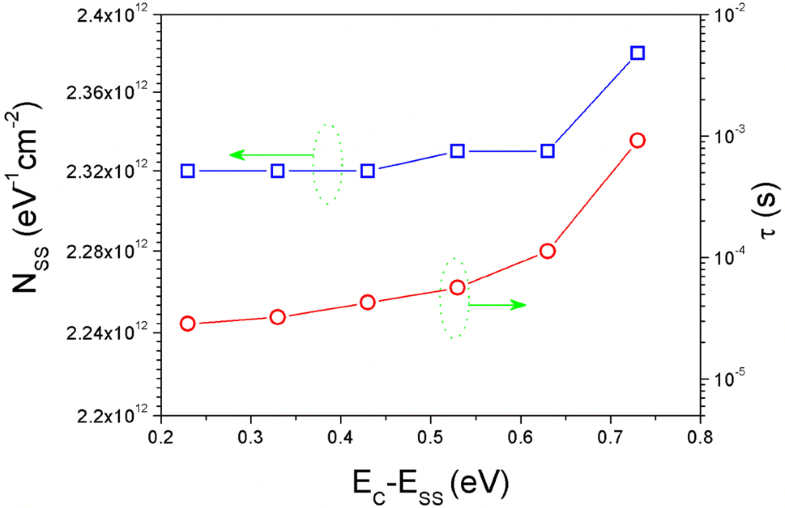 The potential change in barrier height for the Au/Fe3O4/n-GaN HJ could be explained on the basis of surface energy band bending between the interlayer and III–V semiconductors. In addition, the change may also create a native barrier lowering effect caused by field emission at metallic diffusion spikes with confined radii of curvature . The deviation of the barrier height of Au/Fe3O4/n-GaN HJ is more than the Au/n-GaN SJ, due to the excess deviation in thickness of the Fe3O4 layer developed on the GaN substrate. In order to prove that the increase in barrier height and decrease in current in the Au/Fe3O4/n-GaN HJ should be explained using tunneling probability exp(− aδ(χ)1/2) or on the interlayer thickness. Figure 1 shows the current in both directions (forward and reverse) in the Au/Fe3O4/n-GaN HJ is reduced compared to the Au/n-GaN SJ due to the existence of interlayer, and the linear intercept (IS) value of the forward bias current is lower than that without interlayer one (SJ). Moreover, an average ideality factor value (1.87) shows that the structure conforms metal/interlayer/III–V semiconductor (MIS) structure instead of the ideal SJ. The tunneling barrier height is obtained as χ = 0.14 eV for the Au/Fe3O4/n-GaN HJ using Eq. (5). According to Card and Rhoderick , the increase in barrier height was influenced by interlayer which is due to the tunneling in both n- and p-type semiconductors. From Eq. (8), the calculated theoretical field lowering coefficient values, bPFE and bSE, and measured slope values for ten Au/n-GaN SJ and Au/Fe3O4/n-GaN HJ diodes are represented in Table 1. As shown in Table 1, the experimental slope values are close to the theoretical values of PFE at lower bias region and SE at higher bias region for the SJ, whereas slope value is closely matched with the theoretical value of PFE for the HJ. Hence, the current conduction of the Au/n-GaN SJ is affected by Poole–Frenkel emission at lower bias (region I) below 0.7 V and by Schottky emission at high bias (region II) above 0.7 V, whereas the Au/Fe3O4/n-GaN HJ follows Poole–Frenkel emission over the entire voltage range. Specifically, Poole–Frenkel emission is closely related to the tunneling of carriers and also associated with wide distribution of traps in the band gap of dielectric material. In addition, the traps act as impurities and/or structural defects may cause the trapping/detrapping carriers affecting the device performance. However, the Schottky emission is directly responsible for the conduction through the contact interface rather than from bulk material. In general, a good way to extract information on Schottky diodes, capacitance measurement is one of the best nondestructive methods. Based on the theory, it is found that the measured capacitance is larger than the space charge capacitance in the forward bias of some diodes. The difference between the measured capacitance and the space charge is called the excess capacitance and is ascribed to interface states. In fact, this interface states were created by the interdiffusion of atoms, dislocations or discontinuities in crystal lattices or dangling bonds in crystal which is close to the metal/III–V semiconductor interface. The interface states capacitance is a function of the frequency and forward bias current [39, 40, 41]. Figure 5 shows the room temperature voltage-dependent capacitance–frequency (C–f) characteristics of the Au/Fe3O4/n-GaN HJ in the voltage range from 0.0 to 0.6 V with steps of 0.1 V. At depletion region, the measured capacitance decreases with frequency for all voltages (Fig. 5). It is noticed that the high value of measured capacitance located at lower frequencies is attributed to excess capacitance arising from the interface states that are equilibrium with III–V semiconductor (n-GaN) and respond to the ac signal [42, 43, 44, 45]. These behaviors direct to continuous distribution of interface states, which play a key role to reduce of the response of the interface states to the applied voltage [46, 47]. Figure 6 displays the measured voltage-dependent conductance–frequency (G–f) characteristics of the Au/Fe3O4/n-GaN HJ in the voltage range from 0.0 to 0.6 V with steps of 0.1 V. The G–f data reveal that the conductance has nearly constant value at low frequency regime (103–105 Hz), and afterward, the conductance suddenly increases with an increasing frequency for different voltages. The total density of interface states (NSS) is obtained by the experimental C–f measurement of the Au/Fe3O4/n-GaN HJ. The NSS can be extracted for each applied voltage directly from the ordinate of the plateau region of C–f plots. Consequently, Eq. (11) is fitted to the experimental values of C–f to calculate relaxation time (τ) of the interface states. To extract the voltage-dependent NSS and τ values, the fitting procedure is repeated for different voltages. The dependence of NSS and τ on the different voltages is converted to function of ESS by using Eq. (14). Figure 7 shows the experimental NSS and τ versus EC–ESS plots at room temperature. It is noticed that the NSS achieved from the capacitance approach has an exponential increase with voltage from the mid-gap toward the bottom of the conduction band and values are ranging from 2.32 × 1012 eV−1 cm−2 at EC-0.23 eV to 2.38 × 1012 eV−1 cm−2 at EC-0.73 eV, respectively. The Fermi level fix based on these trap levels at a given bias and actual electron density will be at the interface of interlayer/GaN, which results the capture rate of the related trap levels. In fact, this capture and emission arise from traps located within a few values of kT/q above and below the Fermi level. If the frequency is considerably change from the capture rate, losses are minimized for the reason that trap levels either do not respond with different frequencies. The NSS estimated in this work is comparable with that reported NSS in the literature. For example, Bulbul et al. have reported the NSS ranging from 2 × 1010 to 5 × 1012 eV−1 cm−2 for the Au/Bi4Ti3O12/SiO2/n-Si (MFIS) structures. Erdogan and Gullu  demonstrated that the NSS for the Au/Cr2O3/p-Si device varied from 2.90 × 1013 to 8.45 × 1012 eV−1 cm−2. Rajagopal Reddy et al. have reported the NSS varied from 2.743 × 1012 to 5.614 × 1011 eV−1 cm−2 for the Au/NiO/n-GaN heterojunction. Venkata Prasad et al. showed that the NSS for the Au/Y2O3/n-GaN MIS diode varied from 6.268 × 1012 to 2.094 × 1012 eV−1 cm−2. Manjunath et al. demonstrated the NSS being varied from 9.753 × 1012 to 1.990 × 1011 eV−1 cm−2 for the Au/Sm2O3/n-GaN MIS structure. The estimated interface state density of the Au/Fe3O4/n-GaN heterojunction is in a good agreement with that of the reported values. In addition, Fig. 7 shows the relaxation time (τ) values show a slow exponential increase from the top of the valance band with regard to the mid-gap and the values are 2.85 × 10−5 s at EC-0.23 eV and 9.21 × 10−4 s at EC-0.73 eV, respectively. So, it is observed that the obtained τ values are clearly voltage dependent at room temperature measurements. In summary, the statistical distribution barrier heights, reverse current conduction mechanism, voltage-dependent capacitance–frequency (C–f) and conductance–frequency (G–f) characteristics of the Au/Fe3O4/n-GaN heterojunction (HJ) are investigated. The average barrier heights and ideality factors are extracted by statistical analysis from I–V characteristics, and the values are 0.70 eV and 1.62 for the Au/n-GaN Schottky junction (SJ) and 0.84 eV and 1.87 for the Au/Fe3O4/n-GaN heterojunction, respectively. Results show that the barrier height for the HJ is enhanced with 0.14 eV than the SJ, which is attributed to the insertion of the interlayer (Fe3O4) between the Au and n-GaN substrates. Observations showed a transition from Poole–Frenkel emission at lower voltage range to Schottky emission at higher voltage range for the SJ, while the HJ exhibited Poole–Frenkel emission over the complete voltage range. The higher values of capacitance are achieved at lower frequencies, which is due to the excess capacitance from the interface states in equilibrium with the n-GaN that could respond to the applied ac signal. Noticed that the conductance shows nearly constant value at 103–105 Hz, and then, the conductance suddenly rises with rising frequency for various applied voltages. The interface state densities (2.32 × 1012 eV−1 cm−2 at EC-0.23 eV to 2.38 × 1012 eV−1 cm−2 at EC-0.73 eV) and relaxation times (2.85 × 10−5 s at EC-0.23 eV and 9.21 × 10−4 s at EC-0.73 eV) are extracted for the Au/Fe3O4/n-GaN HJ by using C–f and G–f characteristics. The obtained results suggested that the Fe3O4 interlayer may be useful candidate for the development of metal/interlayer/semiconductors (MIS) device applications. Uma is highly grateful to Department of Science and Technology (DST), New Delhi, for providing financial assistance in the form of DST-INSPIRE FELLOWSHIP to purse PhD program. This work was also supported by the National Research Foundation of Korea (NRF) funded by the Ministry of Science, ICT and Fusion Research (2018R1D1A1B07040603) and BK21 Plus funded by the Ministry of Education (21A20131600011).